This Vantiv Development-in-Action topic, digs into the Hosted Checkout application development integration capability using the Vantiv eCommerce platform. This Vantiv Developer-in-Action will show you how to use the eCommerce platform with the .NET SDK and C#. The Vantiv eCommerce platform provides rich payment processing features that developers can use to build flexible and powerful payment enabled applications. In most cases, all of the advanced features of Vantiv’s eCommerce platform are available regardless of the integration method chosen. The exception is batch functionality with requires that transactions be submitted as XML . The eCommerce SDKs are designed for use with online processing only. Using the video, knowledge and resources on this page you will learn how to download the sample MVC based C# .NET project, load the project into Visual Studio, explore the sample application source code, see the application in action, and learn how to find additional resources to help you in your own application development projects. 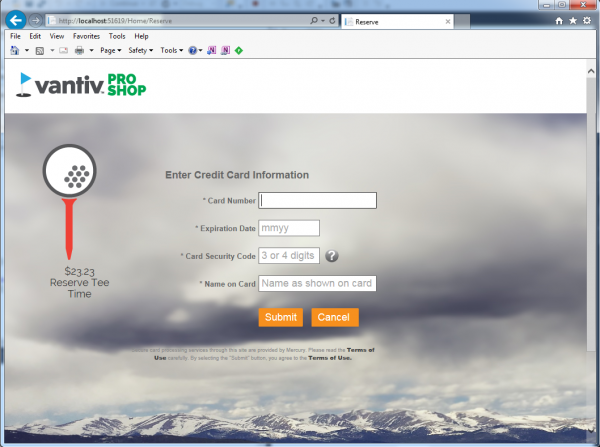 The Visual Studio C# MVC .NET website sample application shows how to integrate to Vantiv’s eCommerce Hosted Checkout platform. The sample application uses an iFrame and performs styling of the hosted site using CSS. 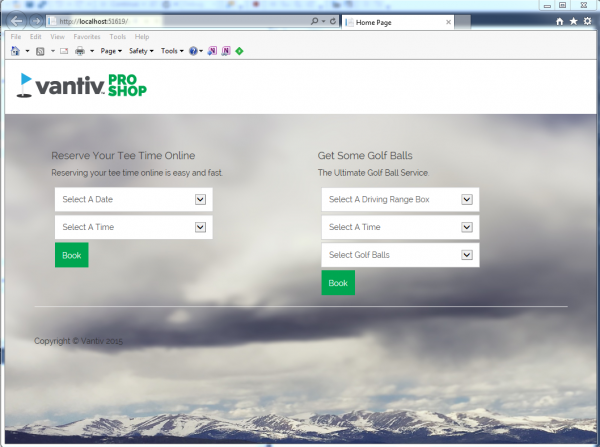 The sample application implements a Vantiv Pro Shop application that allows golfers to reserve tee times and purchase some golf balls. After the user clicks the “book” button, the browser is redirected to the hosted checkout page embedded in an iFrame. The user enters their credit card information, and the authorization happens on the eCommerce platform. After the authorization occurs, the code calls the VerifyPayment to get additional transaction information to display to the golfer. Hosted Checkout also allows developers to do some CSS styling for the browser interface. This sample application includes code to upload the CSS to the eCommerce platform. If you are new to the Vantive Commerce API, you might start by reading the blog post, “Getting started with Vantiv’s eCommerce SDK“. This article gives you an overview of how to get started using the eCommerce API and shows how you can quickly be productive testing payment transactions against Vantiv’s eCommerce sandbox. Note: req.DisplayStyle = “custom” — this allows for custom styling attributes via a CSS upload mechanism. 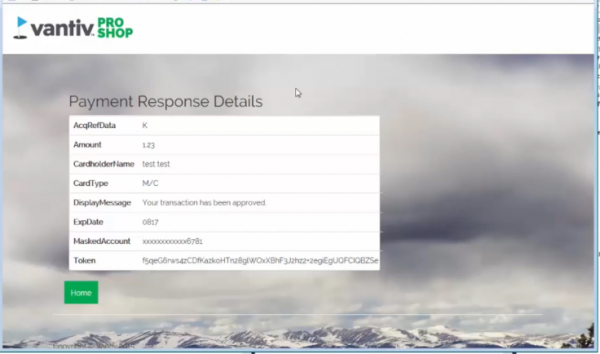 In the Home Controller’s Buy action we are setting the ViewBag.URL property to the URL of the hosted checkout page and appending the PaymentID returned in the response. We will use this ViewBag property when rendering the page in the View. This code is in the Buy.cshtml View. Notice we are setting the src property of the iframe to the ViewBag.URL that we set above. When we set this src property and the iframe renders the iframe will be redirected to the Hosted Checkout page where the customer will enter their card data. After the customer enters their card data and presses submit the payment is processed. When payment processing is complete the browser is redirected to the ProcessCompleteUrl sent during InitializePayment. At that point the VerifyPayment method is called to gain access to all of the properties of the response. Make sure to set DisplayStyle = “custom” in the InitPayment call to allow CSS customization. There are two webmethods that will help you perform CSS styling of the hosted page and are shown below. After uploading the initial CSS you can modify the CSS by calling UploadCSS again which will overwrite the original. The only reason to call RemoveCSS is if you no longer require CSS customization or to test/validate that your CSS customizations are taking effect.